Infant capsule and in-car base.Group 0/0+. In car installation - Group 0/0+ car seat. Please stricly follow provided instructions for use. On car backseat, installation with 3-point car seatbelt or on its base. On front seat only if airbag system is disactivated. With 3-point car seatbelt or on its base. On its base: no need to touch car seatbelts after in-car base is installed. 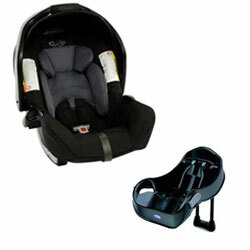 Suitable from birth up to 13 kgs (about 12 months). It is proposed here with a in-car base for an even easier installation. Base is installed in the car seat once and for all ; each time you're getting into the car with baby, you'll only need to clip his car seat on the base (one-click only). I would highly recommend the services offered by Baby'tems. We recently rented a car seat and base for a week travelling through France. Baby'tems delivered and picked-up the car seat from our apartment as scheduled and was a pleasure to deal with. This was our first trip with our 8 month old and we learned that the additional baggage required to travel with a little one is a nuisance. Renting quality equipment like this is a great option.